Bombing Squadron 4 (VB-4) was formed from various segments of the Scouting Squadrons VS-41 and VS-42 after the USS Ranger´s involvement in OPERATION TORCH in Morocco and Algeria in November, 1942 (See The Ranger Air Group Over Casablanca). Bombing 4 was known as the "Top Hatters." The "Top Hatters" designation has been traced by Thomas Gates from its origin as a Scouting Squadron to its final use by the jet squadron "Fighting Fourteen." Early in World War II, some of the pilots of VB-4 flew the Vought/Silorsky SB2U "Vindicators." 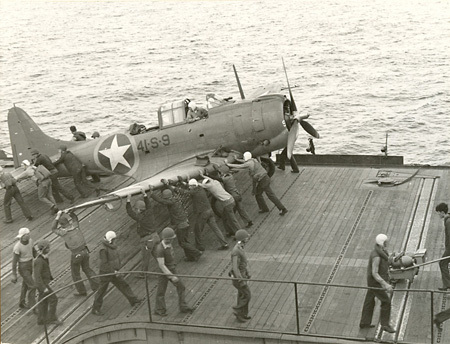 This plane was not a satisfactory dive-bomber and was soon replaced by the Douglas SBD "Dauntless." 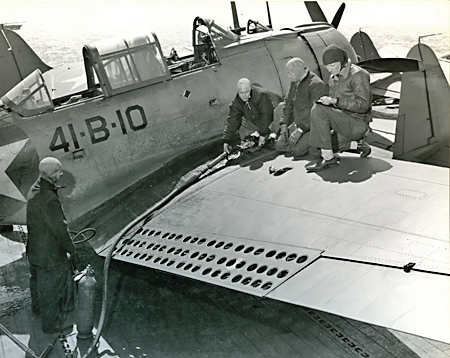 The SBD served Bombing Four well as a dive-bomber, inflicting severe damage to the enemy during operations in North Africa and along the Norwegian Coast. 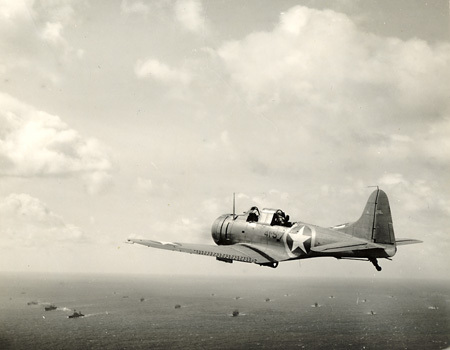 SBD Dauntless dive-bomber from Ranger flies anti-sub patrol during OPERATION TORCH. Ranger plane handlers push an SBD Dauntless dive-bomber into takeoff position after it has just landed from a strike on French North Africa. Notice the VS-41 numbering on the plane. Plane handlers remove an SBD from the Ranger flight deck. SBD on Ranger being re-fueled. The SBD held a pilot and a crewman who served as gunner and radioman -- and often as photographer. The gunner had to open the hatch to operate the twin 30-caliber machine guns. Dive flaps were opened during bombing runs. Maximum bomb load was 1200 pounds, carried externally. 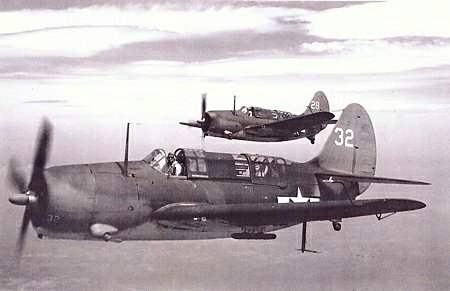 When Air Group 4 left the Ranger and reformed on the East Coast in the spring of 1944, VB-4 was assigned Curtis SB2c "Helldivers" to replace the reliable old SBDs. The Hellcat was faster and carried a larger bomb load, but was more difficult to operate as a carrier plane, earning the nickname "The Beast." 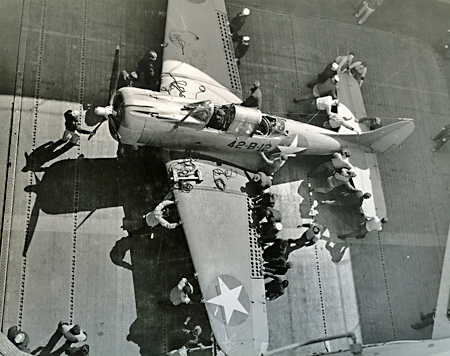 VB-4 flew the SB2c while aboard the USS Bunker Hill in November 1944 for strikes against Japanese shipping and shore installations in the Philippians. On November 17, Air Group 4 (VB-4, VT-4, and VF-4) was transferred to the USS Essex. Aboard the Essex, VB-4 survived a Kamikaze attack on November 25, 1944, engaged in a number of strikes against the Japanese, and experienced the "Halsey Typhoon." 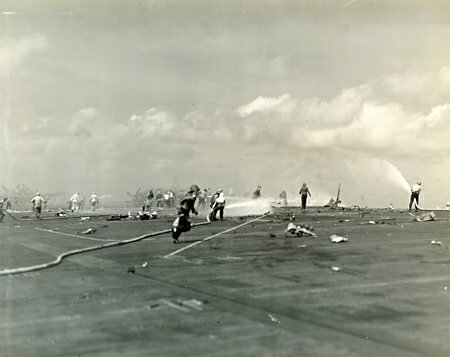 Fighting fire on USS Essex after Kamikaze strike November 25, 1944. The deck is littered with fragments of the Japanese plane. 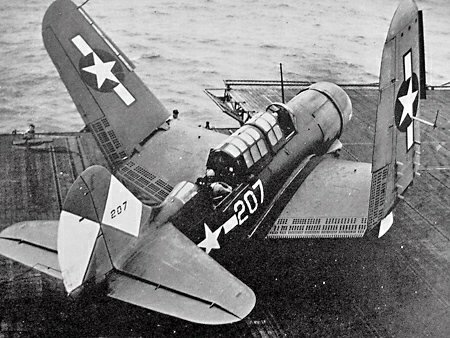 A Helldiver can be seen on No 2 elevator. 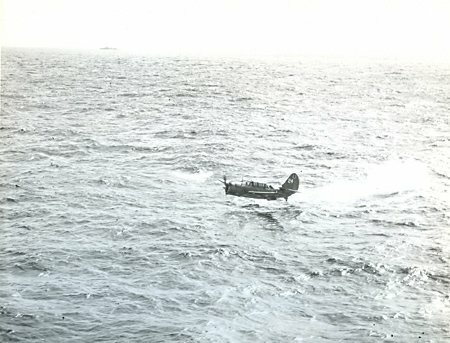 A Helldiver from the USS Hancock makes a water landing following a strike on the Philippines. November 4, 1944. On December 28, 1944, Marine Squadrons VMF-124 and VMF-213 replaced VB-4 on the Essex (See War Diary of Two Marine Squadrons). Several of the VB-4 pilots were assigned to VF-4 as Hellcat pilots and the remainder of the squadron was sent to Orate Airfield on Guam. During World War II, the Top Hatters made a substantial contribution to the war effort and grieved the loss of a number of brave airmen. Photo: USS Ranger´s VB-4 Tophatters 1991 Reunion. To become a pilot you need quick reflexes and great eyesight. Without modern guidance systems, it was much harder to guarantee you were on target. Today we have Lasik surgery to correct your eyesight. If you went to Eye Lasik Austin you could have your eyesight returned to 20/20 vision.